We are proud to announce that our work has been displayed at this year's TED conference, where the world's greatest thinkers and doers come together. We were asked to provide visualisations that helped tell the story of open data in 2009, for Sir Tim Berners-Lee to give an update on open data since his talk last year. We chose to tell the story of 'OpenStreetMap - Project Haiti'. We all followed the crisis that unfolded following the Haiti earthquake, many of us chose to donate money, a few were flown out and deployed as part of the relief effort. But what practical impact can many have without being there in Haiti itself? Well, during this crisis a remarkable story unfolded; of how people around the world could virtually collaborate and contribute to the on-the-ground operations. With the little existing physical, political and social infrastructure now destroyed or damaged, the situation was especially challenging for aid agencies arriving on the ground. Where are the areas most in need of assistance, how do we get there, where are people trapped under buildings, which roads are blocked? This information is important to the rescue agencies immediately after the event, and to the longer rebuilding process. In many developing countries, there is a lack of good mapping data and particularly after a crisis, when up-to-date information is critical to managing events as they evolve. 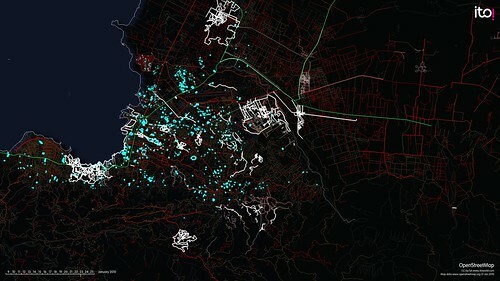 Each flash represents a new edit into OpenStreetMap, and this visualisation is a vivid picture of how much work was contributed by volunteers, following the quake. First the primary and secondary roads (green and red) are added and then smaller residential streets and many other features such as the blue glowing camps of displaced people that emerge. Its not all about OpenStreetMap however, a variety of organisations provided technical solutions with vital services, such as Ushahidi - a service where anyone in Haiti can send an SMS message with their location and report an emergency or need. All this information is then aggregated and publicly displayed in near real-time, on a platform that almost anyone can use. What does all this have to do with ITO World and transport? Well, we want to visualise and tell the story of transport - how does the network function, what is the story of your commute, how will this planning decision affect transport in my city? We are working on powerful analytical tools that will visualise the current status, and future scenarios of transport networks enabling us to make better decisions. By creating a narrative around transport, people can understand how and why decisions are being made, and collaborate to build a better transport system that meets their needs. "After the crisis, thousands of people from all over the world were able to contribute and build what is now the most complete map of Haiti"
The crisis is in no way over. We are creating a video about use of Information and Communications Technology in international development programs for the World Bank, and we would like to use the imagery from Project Haiti. How would we go about gaining permission to do so? This is a non-profit project. No problem at all with re-use - Both the animations and the imagery for Haiti are licensed as cc-by-sa so you (and others) are free to use them as you see fit as long as you acknowledge the source. Do please drop a comment onto the blog with the URL of you resulting work so other people can see it but no obligation to do that. Luke, you are very welcome to use the presentation (which is arlready available on a ccbysa license). Regarding PP I can't help you however I do remember finding it very difficult, impossible? to get PP to work with video. 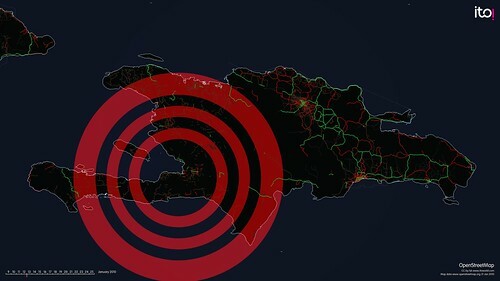 This video is very interesting and I would like to show it to students in French West Indies-Guadeloupe University Diploma the name is Preparation in Humanitarian Disaster. I would like to comment when video is running. So I would like to slow the running. How is it possible to do it. Apologies for such a long delay in responding - I missed the original comment. I suggest you use some external movie editing software to slow it down - won't be perfect but should work reasonably well. Would love to respin it for you, but we just don't have the time.